Omega 3 drink - wolting-internationals Webseite! 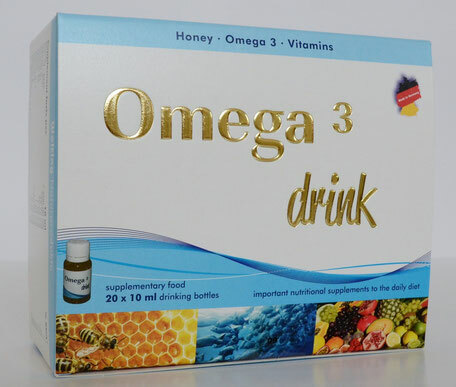 Omega3 drink is a modern, liquid nutritional supplement and a positive addition to the daily diet. You feed the body with nutrients which are partially missing in the modern industrial manufactured food. Essential fatty acids are natural components of fats and oils. They regulate blood pressure, blood lipid levels and body temperature, stimulate hormone production and sensibilize nerve fibres. They are also very helpful during a diet. Helps maintain normal cholesterol levels. Important component of brain tissue, offers nutritional support to the cardiovascular system and the joints. Helps to maintain healthy and blood flow. Supports healthy platelet function, important for optimal joint function, important for maintaining connective tissue health and comfort and may reduce the risk of coronary heart disease. 1 bottle morning taking sips . The stated recommended daily dose should not be exceeded. Shake well before consumption. Turbidity and bottom set are a sign of quality and have no influence on the quality of the product. Food supplements should not be used as a substitute for a varied and balanced diet and a healthy lifestyle. It should be noted that there may be a hypersensitivity in allergic patients on revenues of royal jelly, bee pollen and honey. Allergen information: This product contains allergenic ingredients to be labeled according to Regulation (EU) Nr.1169 / 2011, which can trigger an allergy or intolerance reactions. This product is produced under sanitary conditions, in accordance with the determination of our HACCP concept, as well as GMP and ISO 9001-2008 . It will be used exclusively raw materials with specified food quality. It does not use genetically modified organisms, nano-materials and hormones. There are no pesticides available and it is free from TSE/BSE. The product does not require labeling in accordance with EC Regulation 1829/2003 and EU Regulation 1830/2003.